Audio MP3 Converter converts audio formats MP3, WAV, WMA, OGG, VQF. It also supports MP3 ID3 V1 Tag and MP3 ID3 V2 Tag Editing. It also supports WAV files Normalizing. Convert MP3 to WAV, WAV to MP3, MP3 to WMA, WMA to MP3, MP3 to VQF, VQF to MP3, MP3 to OGG, OGG to MP3, WAV to WMA, WMA to WAV, WAV to VQF, VQF to WAV, WAV to OGG, OGG to WAV. Audio MP3 WAV WMA Converter is designed for converting the most popular audio formats MP3, WAV, WMA, and OGG from one to another directly and on-the-fly (without temporary files produced). If you want to convert mp3 to wav, convert wav to mp3, convert wma to mp3, and so on, this is exactly what you are looking for. You may download it to try for free. This all-in-one audio converter software supports the following conversions directly, 1. Convert mp3 to wav, mp3 to wma, mp3 to ogg 2. Convert wav to mp3, wav to ogg, wav to wma 3. Convert wma to ogg, wma to wav, wma to mp3 4. Convert ogg to mp3, ogg to wav, ogg to wma This version has removed the VQF support, and we will not add VQF support in the future. If you need to convert VQF format, please download the older version here. Besides converting, it also supports editing MP3 files' included tag information of the first and second version. And it supports normalizing WAV files. The unregistered version is free to try, it will allow 10 conversions for each type. 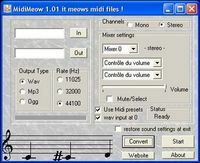 For example, you may convert 10 mp3 files to wav files, 10 mp3 files to wma files, 10 wav files to mp3 files, and so on. If you want to remove the limitation, you may buy a registration code to register it. Click here to buy now, and the price is US$19.95. If you want to convert WMA files, you must install the Windows Media Format codec 9.0 on your computer. The setup package downloaded from this website included the codec package already. When you install the software, it will ask if you would like to install the codec, you must click the "Yes" button.